From vintage linens to silver settings from grandma, these are things a lot of us have but they are often packed away. 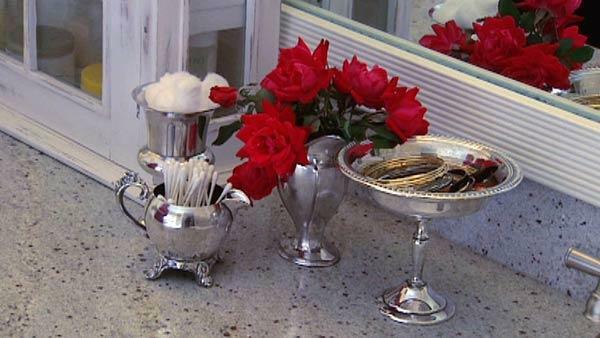 Instead of buying new items to decorate your home, Kat Cosley, host of Deals, shows you how to pull this stuff out and use it. Interior design expert Becki Griffin and author of the blog "Curious Details" believes vintage doesn't have to mean old and boring. "The great thing about using vintage in decor is it is beautiful, but it can be a real money saver when it comes to decorating your home," said Becki, "These are our priceless memories. I think we can bring them out into our home and make them beautiful." Oftentimes family heirlooms include letters or old post cards. "You can take those to your local office supply and they can enlarge them on a machine that is for making engineering copies. I recently had one blown up to 24x36 and I'm going to use it on the wall as a really bold piece of work of art. The office supply store can enlarge a print for you for approximately $5. You can enlarge an entire piece or just enlarge say a postage stamp if you like. Blow it up, frame that and put it on the wall and it's really graphic and eye catching -- tells a story. Not only are you creating a beautiful one of a kind work of art, you got it at a great deal," said Becki. Silver: Use 3m Velcro on the back of platters and hang on the wall. Separate pieces from a silver tea set. Use for q-tips in the bathroom or flowers. Paper Weights: Becki removes the back of paper weights and glues pictures in the place of the backing. The shape of the paper weights gives the picture a vintage look. Linens: Frame linen pieces. Becki framed up a few small pieces of linen with a black background. Recreate Vintage Art: Use pages from "field guide" books and frame it. Becki used butterfly pages as an example. Folding Pages: If you don't want to cut pages out of books, you can fold the pages to make beautiful displays. Glass Bottles: Use small bottles with tops to store collections. This is great for sea glass, and other little odds and ends. "Your home is the most important part of our lives. That's where we are. To pull a home together and have it reflects that a family lives there is really important to me," said Becki, "A lot of times that includes vintage pieces - pieces that were your grandmother's or mother's and I love to bring that out into the room and make it part of the decor."